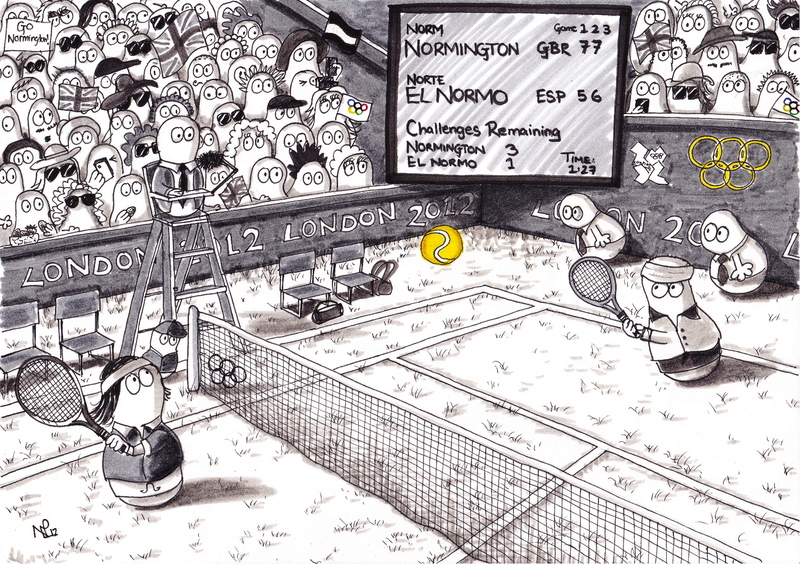 It’s match point and Norm Normington, representing team GB is serving to win gold in the London 2012 Olympic tennis finals. However it’s not easy. Against him is world champion winner of various Norm Tennis grand slams, Norte El Normo, representing Spain. El Normo doesn’t just bounce around like a normal Norm tennis player would do. He can do backflips and high jumps and all sorts of distracting but spectacular moves which make him a real contender for the gold. Despite this, Normington, every the English gentlenorm, polite in his play but devilish in his super-fast serve and quick-fire backhand, is out on top, spurred by the proudest of all home crowds, rousing him to success with their roof-raising cheers and their chants of “Go Normington, Go!”. They’ve even been partial to the odd mexican wave or two during today’s match, which is most unusual for the reserved Englishnorm. Just goes to show how the Olympic spirit is lifting us all, and brining all Norms together as a single Normular nation under the sporting flag. But when it comes to victory, it’s nationality that counts. The question now is will Normington do it for team Great Britain? What an adorable illustration! I love it. I will continue to view your series of ‘Norms and the Olympics”! on a related subject….andy murray finally won in england!!! but at the olympix, not wimbledon. weird irony, i find. I know! But let’s hope it gives him the confidence to go all the way next year!